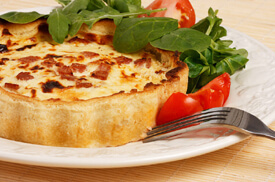 I love the versatility of quiche, and this is one of my favorite version. Filled with buttery leeks and tangy goat cheese, this makes a terrific brunch dish or a light lunch when served with a green salad. Customize this quiche as you wish by swapping in your favorite cheese or vegetables.